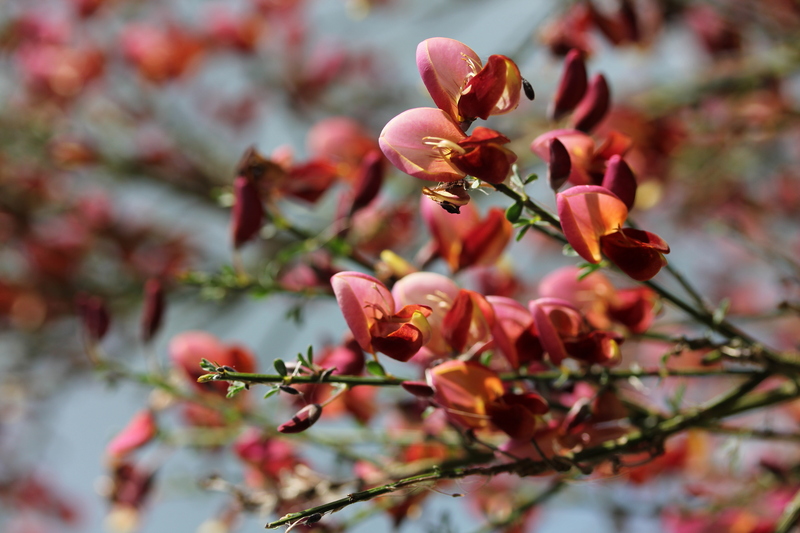 Just a quick post share a branch of the lovely Leptospermum (I think Scoparium). 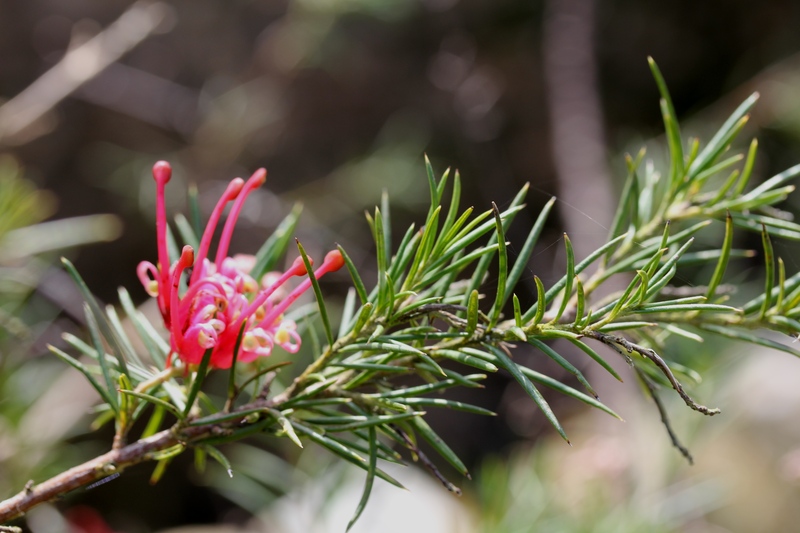 Apparently the common name, ‘Tea tree’ arose because Captain Cook used the leaves to make a tea drink. Who knew? The ‘vase’ is a water bottle provided in a restaurant in San Sebastian which I liked so much I insisted on lugging home in my suitcase. Make sure to note how the label matches the flowers, as I expect next time you see it, the label will be missing – it’s only paper! 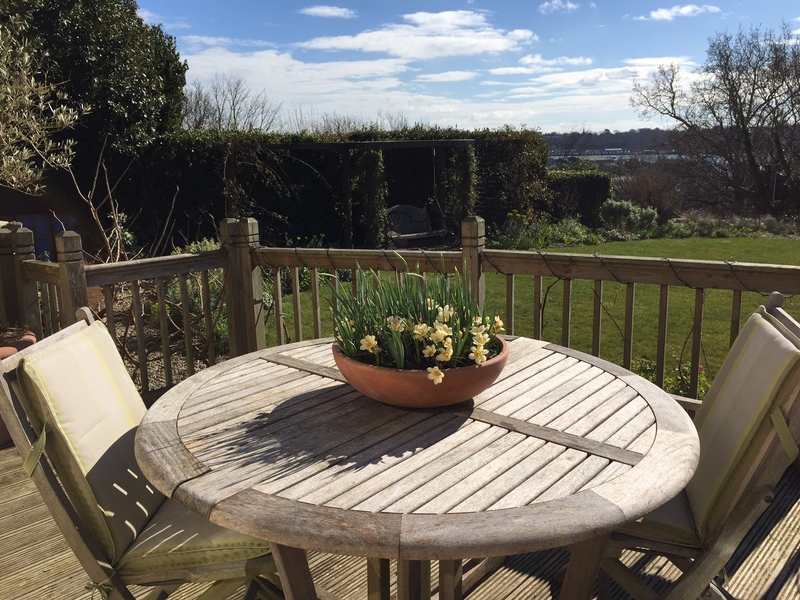 With thanks to Cathy who hosts all our Monday flowers – whatever they’re arranged in. This entry was posted in In a vase on Monday and tagged Leptospermum on January 28, 2019 by jenhumm116. The Frustrated Gardener said the other day “if a garden doesn’t look merry in May, there’s a problem” and although I’m thrilled mine has survived our recent absence (thanks to the dogsitter’s kind ministrations) it’s not ideal that it’s so merry now, as it will doubtless be looking rather exhausted by the garden opening in four weeks’ time! Ah well, at least I can share with you. 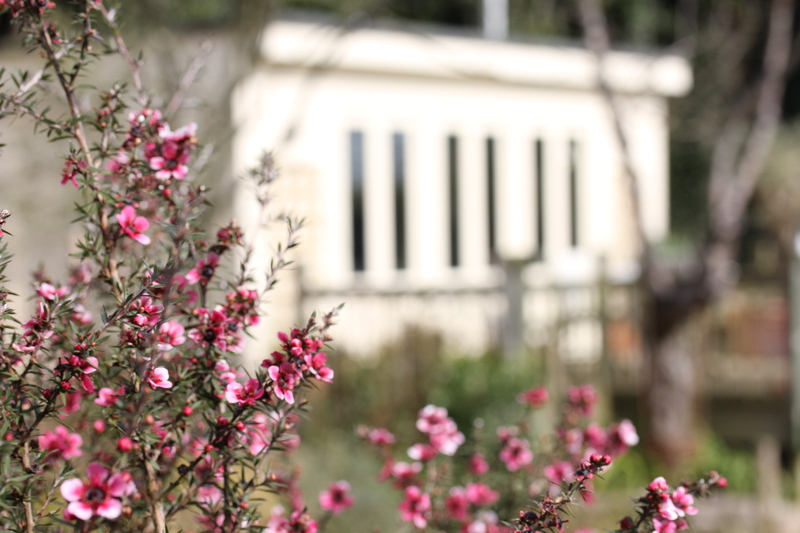 So, this view is the Mid Century bed looking across the Lavender bed to the incredibly flowery Leptospermum beyond. Here it is with an invasion of self seeded Valerian keeping it company. 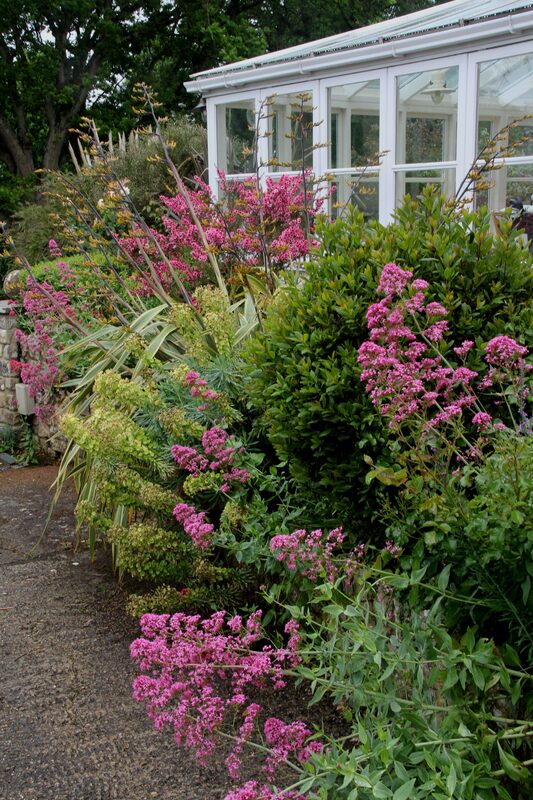 whilst in the left hand one (aside from miles of Convolvulus) there is my ‘old’ Erysimum ‘Bowles Mauve’ and new E. ‘Red Jep,’ lots of pinks and my little Silk Tree. 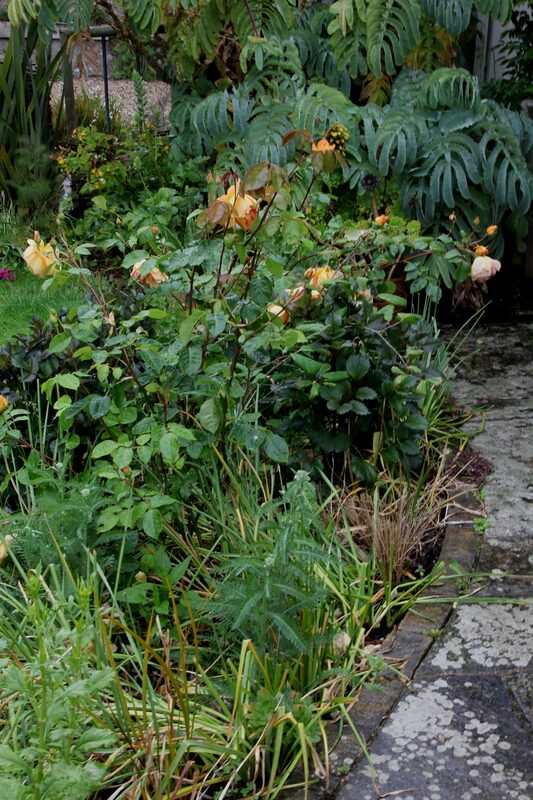 The Swing Beds are wallowing in multiple roses as well as yellow soldiers of Sisyrinchium and pink Diascia personata. 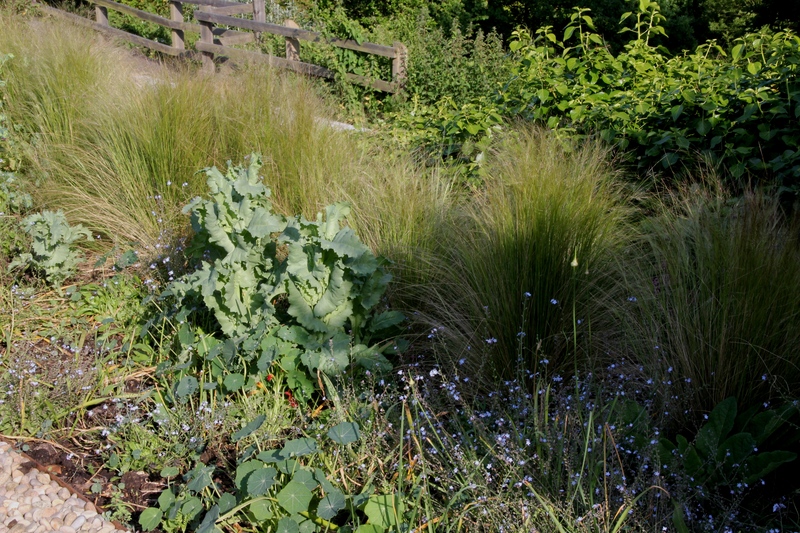 Conversely, the Grass Bed is in a sorry state, with little to entertain except tatty forget me nots and self seeded Nasturtiums and Poppies. 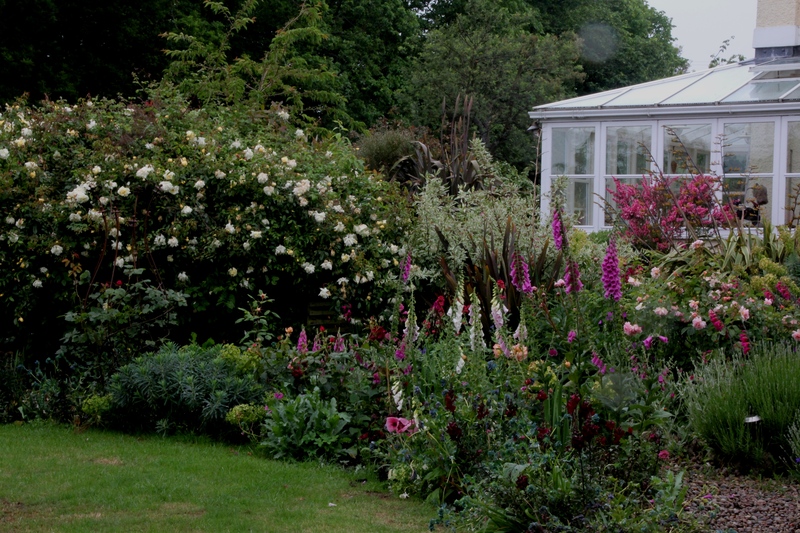 This is due a big clear out and will be planted with annuals, hopefully next weekend. 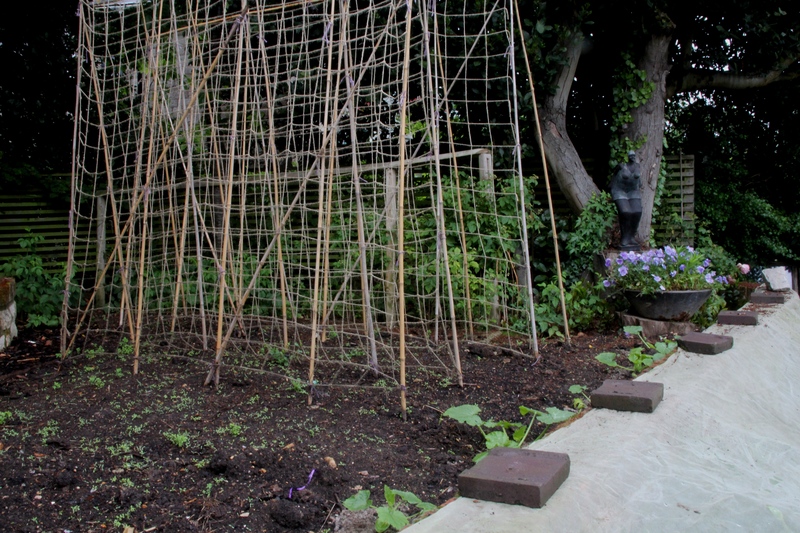 The Veg Patch has moved on from this picture, as I’ve now planted out runner beans and sweet peas. I’m intending to plant further flowers for cutting here, so have only erected two sets of bamboos this year. The fleece to the right is to protect the strawberries in the lower bed, but we’ve now moved it off the wall as it was forcing the Agapanthus flower heads into such awkward twists I felt compelled to liberate them! 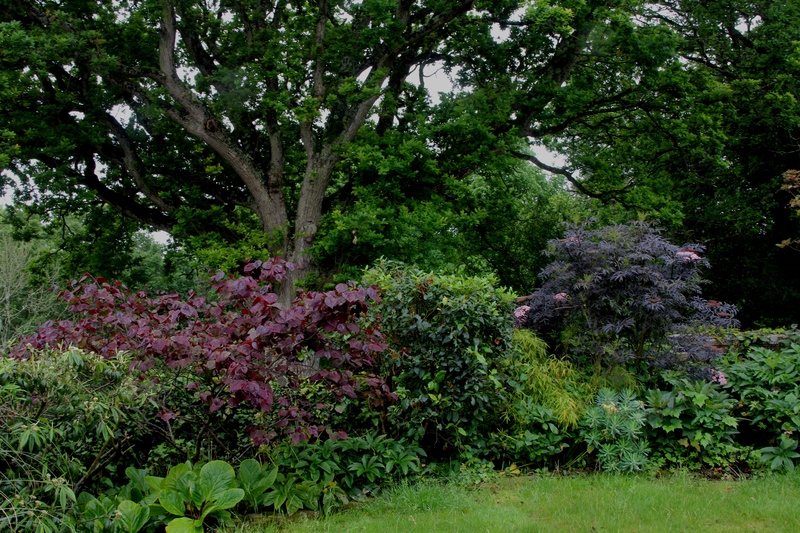 At the other end of the garden the Oak Bed has its summer foliage on, with the lovely Cercis, the Sambucus (and indeed the over-the-road-oak) in full leaf. 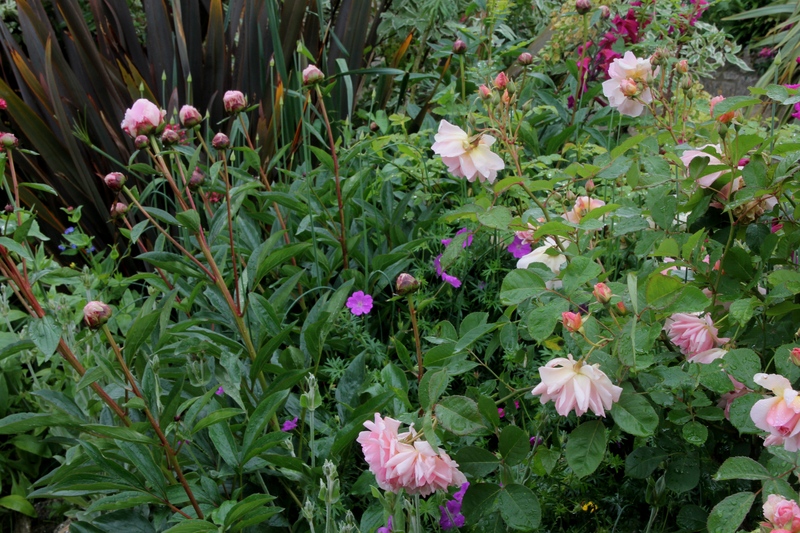 The Pat Austin roses in the Bronze Bed are doing their cantaloupe thing, and will hopefully soon be joined by Achillea ‘Terracotta’ with Dahlia ‘Happy Single Date’ to follow later in the summer. I’m still planting up pots, with the troughs by far the largest. 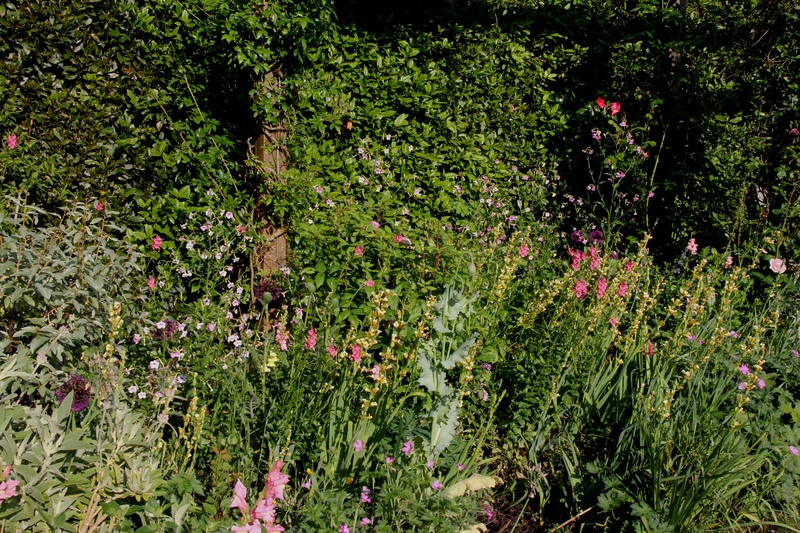 The plan here is a trailing sweet pea ‘Cupid’s Pink’ at the front together with a shorter Cosmos ‘Antiquity’ behind, but there seems to have been a bit of a mix up with the Cosmos lables, so I could end up with any one of four different varieties. Oops. In the greenhouse I’ve finally planted out the tomatoes and cucumbers, but just look what greeted me on my return from holiday. Just imagine the scent! 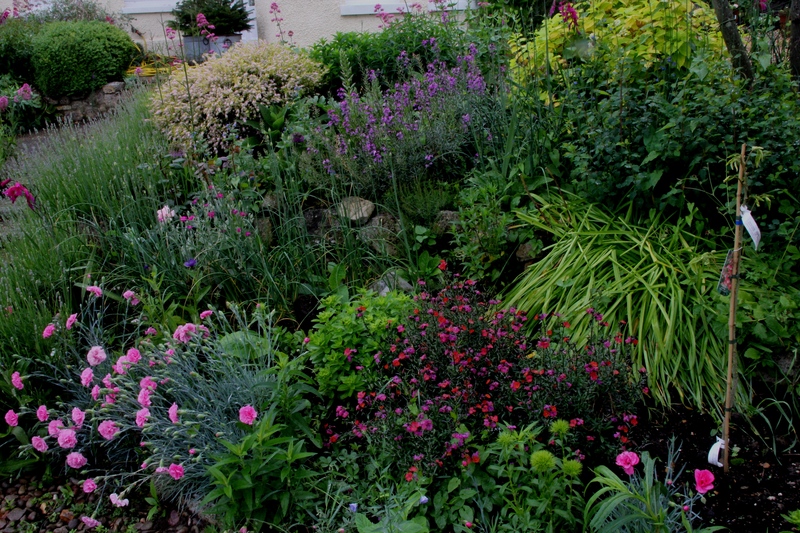 This entry was posted in End of month view and tagged Diascia personata, Erysimum Bowles Mauve, Erysimum Red Jep, Leptospermum, Pelargonium Surcouf, Red Valerian, Sisyrinchium striatum on May 31, 2017 by jenhumm116. I’ve just looked back at my GBBD post from a year ago and it’s all tulips with a few Narcissi – today’s is roses, poppies and pelargoniums. What a mad spring! The rose above is ‘Pat Austin’, the one below a bit of a family joke as I’m not a fan of red and so, when a builder chopped it back to ground level a few years ago I didn’t mourn. However, since then it’s come back bigger and stronger, so I’ve given it a grudging acceptance. 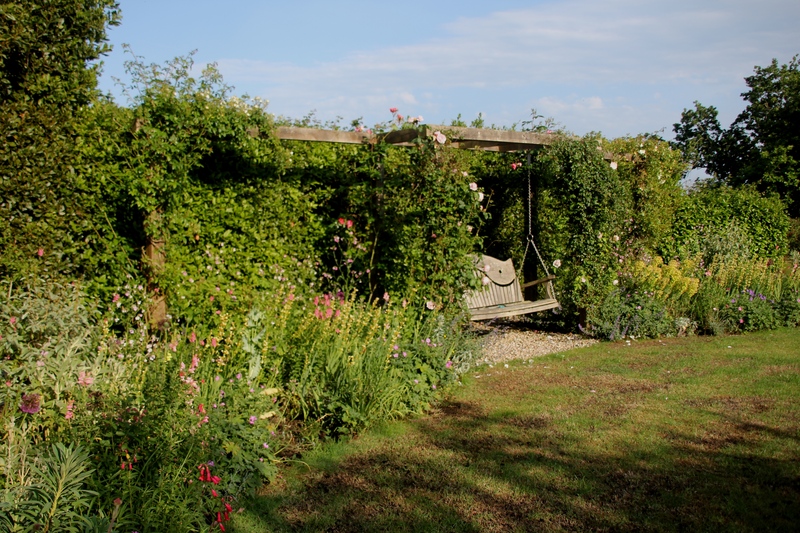 And here’s ‘St Swithun,’ finally looking well established on the pergola. There are a few more roses already in bud so I’m starting to fret they’ll all be long gone by the garden opening at the end of June! 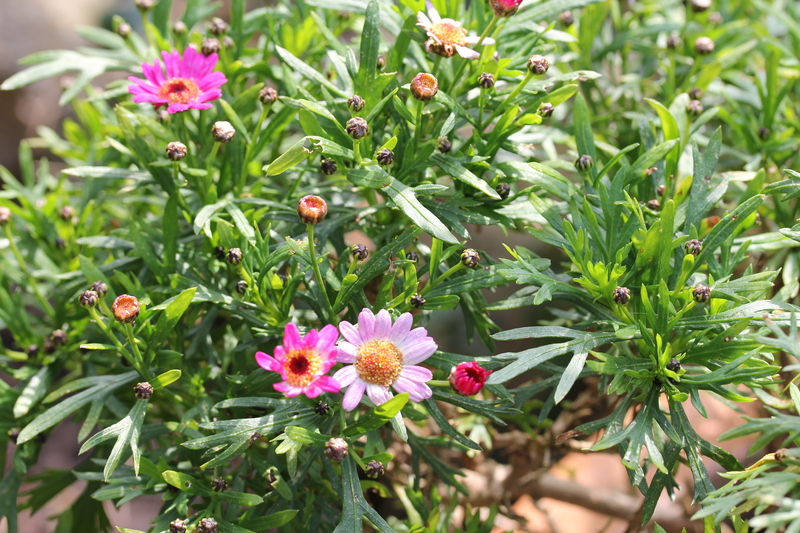 This little Cistus is also looking more summery than the calendar – but then so was today’s sunshine. Having rested for only a couple of months the Leptospermum is back again. 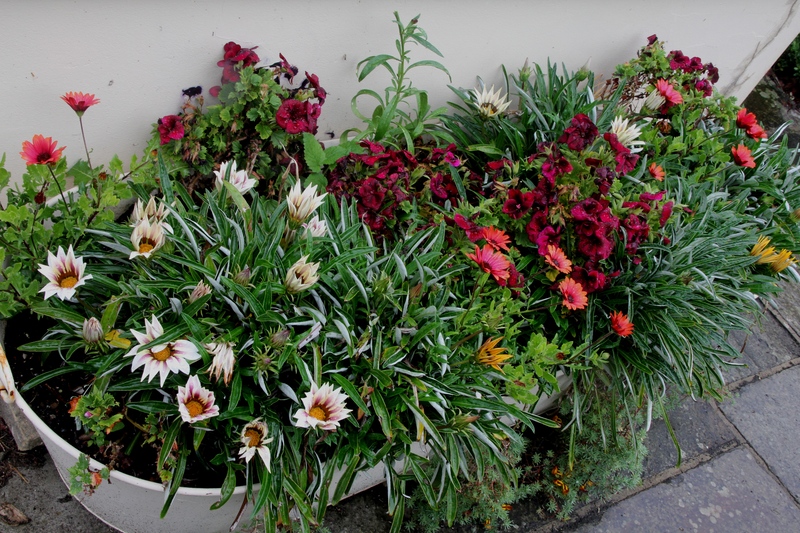 By the front steps I’ve popped some bought Osteospermums into the big bath. I like how the centres pick up the colour of the Pelagoniums behind. Another daisy flower is the Erigeron karvinskianus growing in the crack at the bottom of the steps. Also near the steps is a lovely inherited Genista. The first year we were here it flowered at the same time as the Callistemon, it’s planted next to and together they were quite a sight, but again this year it’s not to be. Two Alliums flowering now. 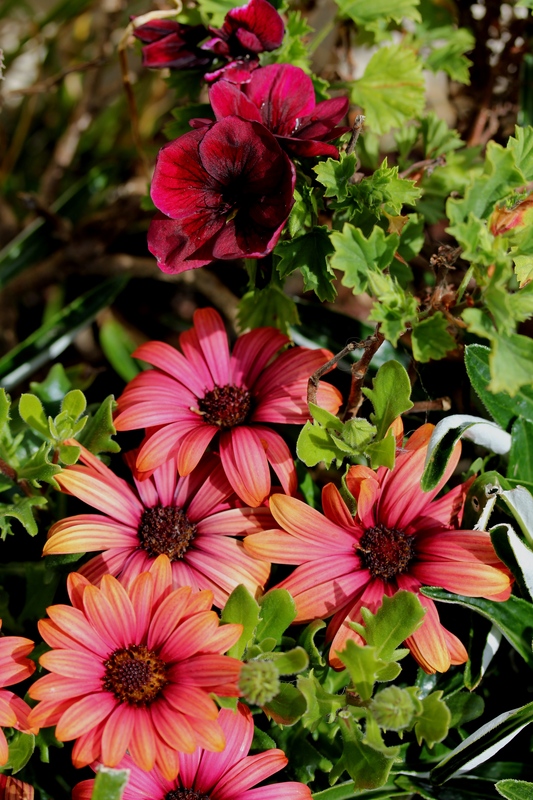 The one on the left is called ‘Violet Beauty’ and was planted in the Drive Bed to flower with a similarly coloured tulip. Not only did they not flower together last year, but this year only about three of the tulips returned, and not many more of the Alliums. I bought a new Geum recently, ‘Prinses Juliana’ (the one on the right), to go in the Bronze Bed with ‘Pat’ (the rose). 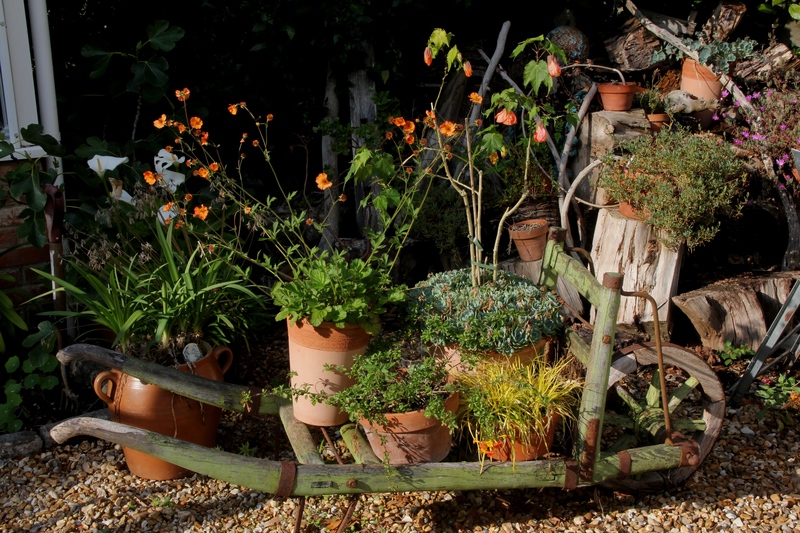 I was perfectly happy with it until I read Sarah Raven talking about G. Totally Tangerine (the one on the left, which I had already in a pot on the barrow). From these photos they don’t look that different, but she’s right, Totally Tangerine is a softer more subtle colour, and definitely a better match for Pat. Darn! More orange from this lovely little plant we brought back from Madeira just a week or so before I started this blog. It hasn’t flowered for years but I’m delighted to see it blooming again. I did find the name at one stage but have now lost it again. Any clues? 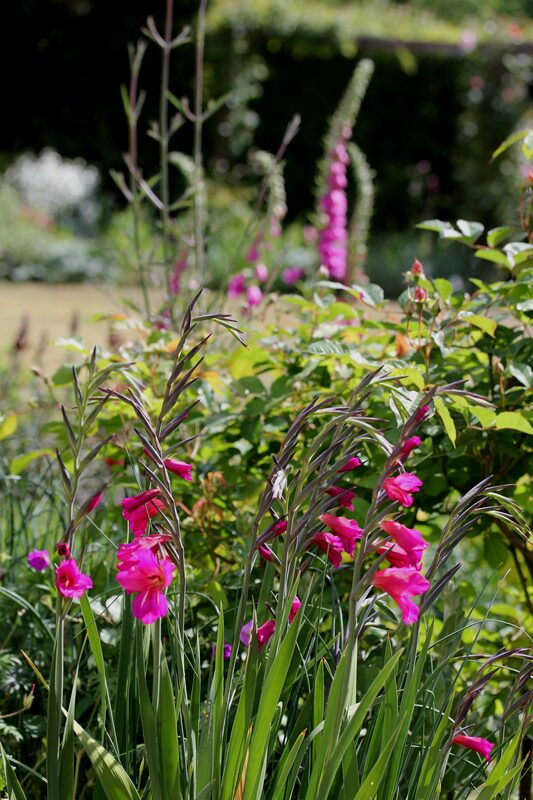 Looking across the Lavender Bed to the Mid Century bed beyond I like how the Gladioli spires are repeated by the Foxgloves. I love this little poppy. I’ve gone a bit mad for them and have planted plenty, some grown from seed (including this one) and some bought as plugs. Let’s hope it works! 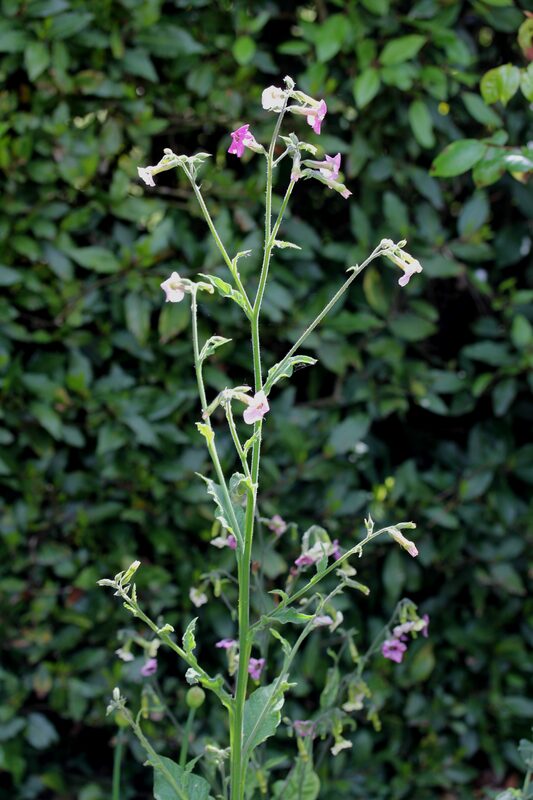 At the back of the Swing Beds these Nicotiana mutablis are now over a metre tall. 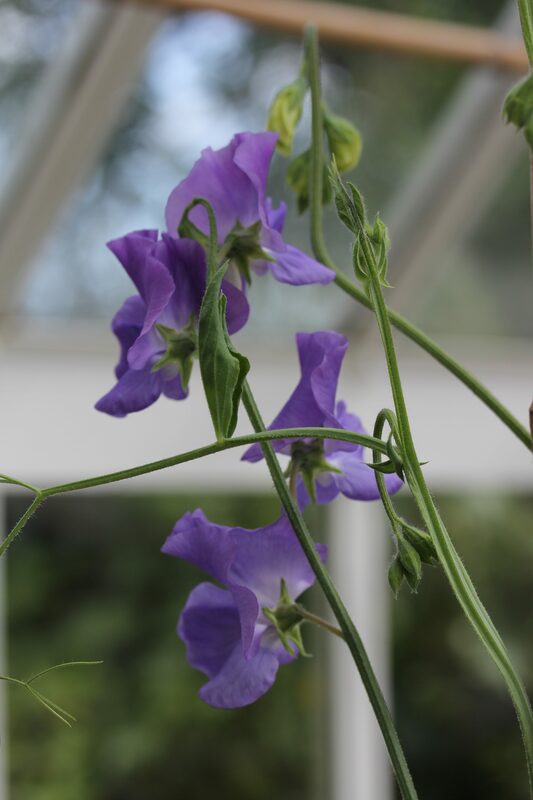 I’m still a bit confused as to whether they self seeded, as they seemed to get going so early, it’s more like they overwintered, There a definitely a few kicking about in seed trays that seem to have survived, so I’m thinking I should plant them out too. 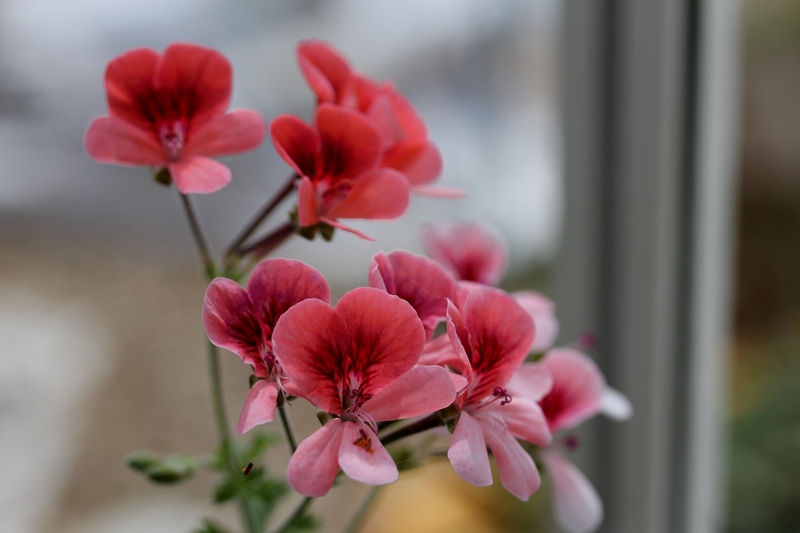 There are a few Pelargoniums blooming now, including this one bought at our local Boot Fair and hence nameless. It’s one of my favourites and I’m forever taking cuttings to increase my stock. 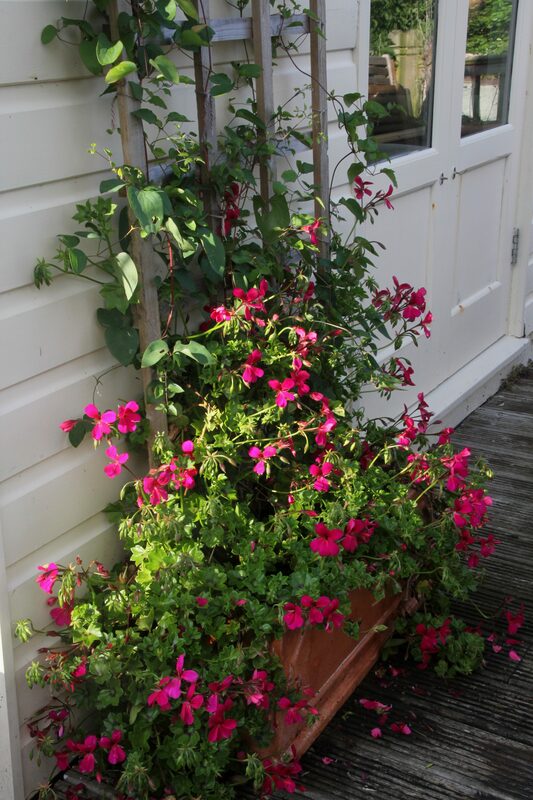 And this is another favourite – Surcouf, in the twin pots on the decking. They’ve gone mad this year! 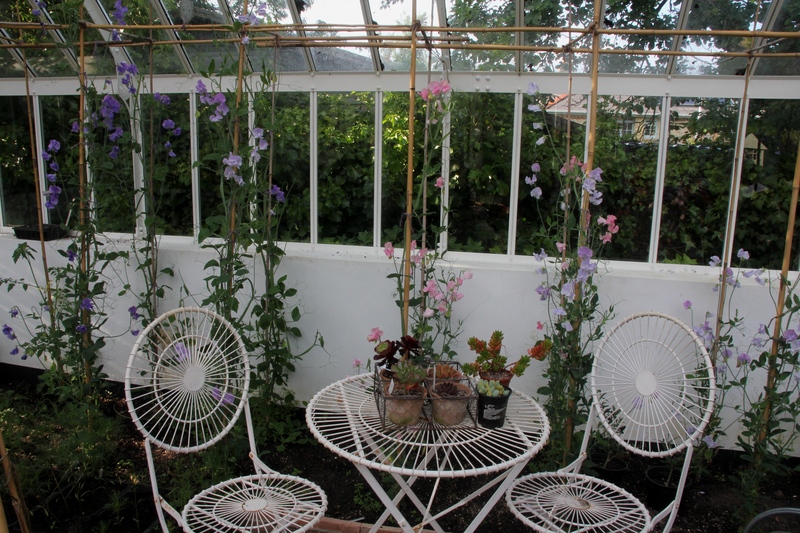 In the greenhouse the Sweet Peas are also going bonkers and I’ve picked a proper big bunch this weekend. To finish I think my favourite bloom today. 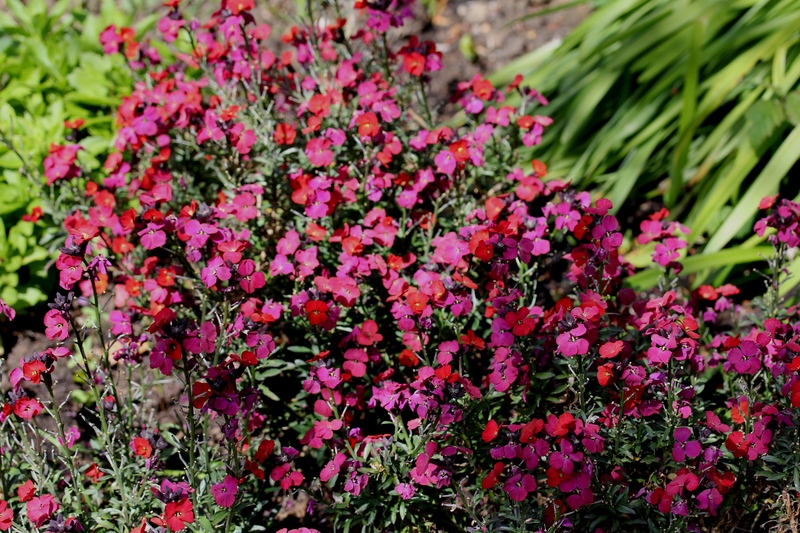 This is Erysimum ‘Red Jep’ which I fell in love with when I saw it at Hyde Hall. I found just one supplier and bought them online last year, but I note this year Sarah Raven has them too! I’ve taken a few cuttings but I really must take more as already they’re looking a little woody at the base so I’m not sure how long they’ll continue to look so good. 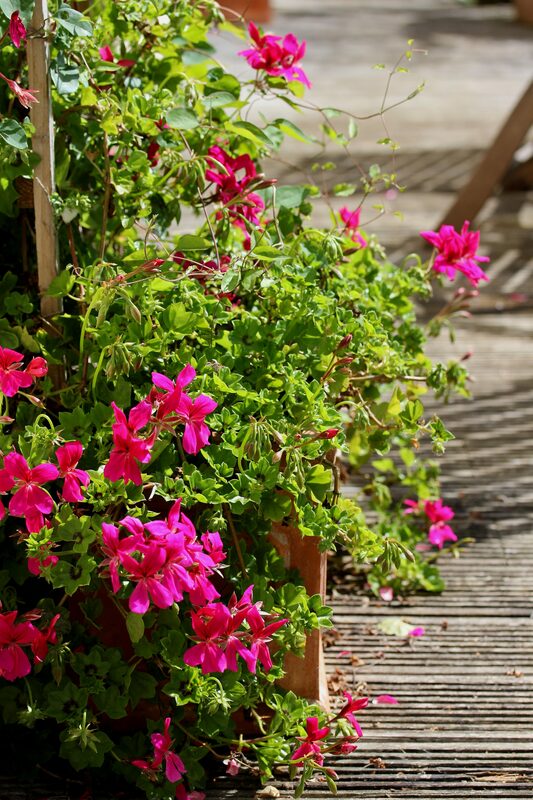 This entry was posted in Garden Bloggers' Bloom Day and tagged Allium Purple Sensation, Allium Violet Beauty, Cistus, Erigeron karvinskianus, Geum Prinses Juliana, Geum Totally Tangerine, Gladioli byzantinus, Leptospermum, Nicotiana mutablis, Pelargonium Surcouf, Rosa Pat Austin, Rosa St Swithun on May 15, 2017 by jenhumm116. 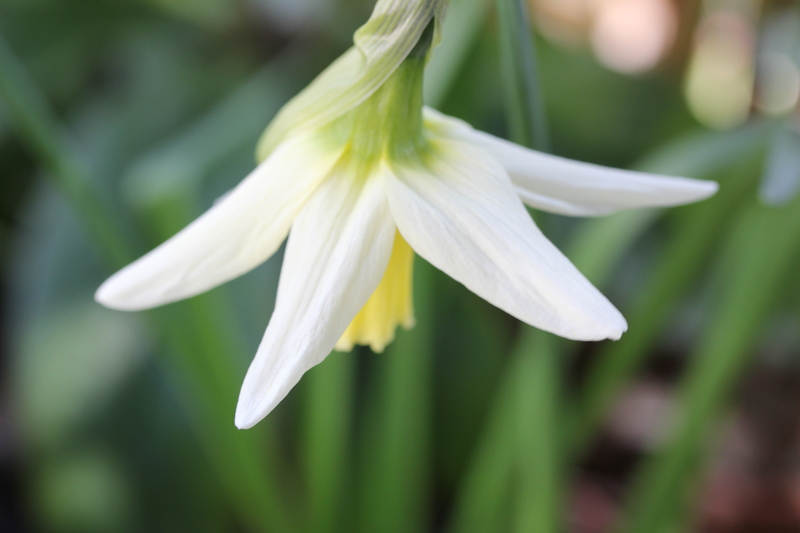 All of a sudden spring has sprung and there are hundreds of blooms to enjoy – not least Narcissus ‘Cragford’, above. And despite moaning last year I’d planted them too close together, I’m delighted to see they’ve all returned! and my first ‘Minnow’ of the year. 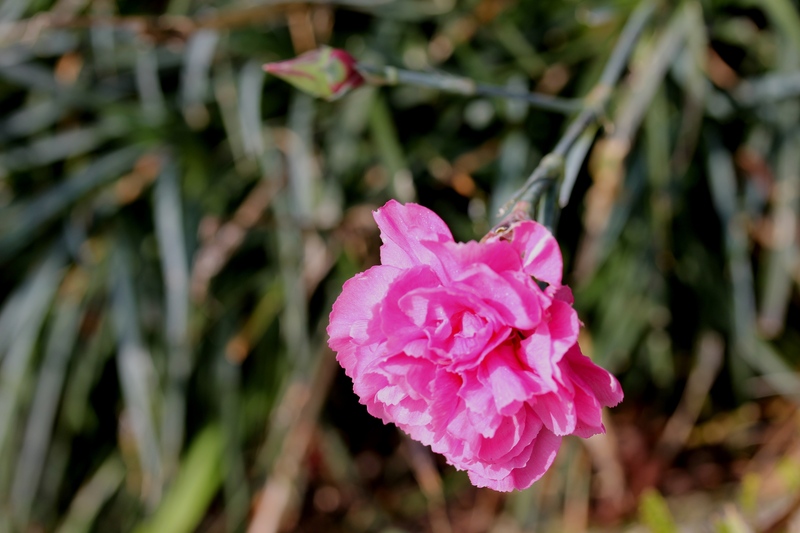 This is definitely one of my favourites – the blooms are really dainty, only about 3cm across, so I hope I’ve planted enough to make an impact. 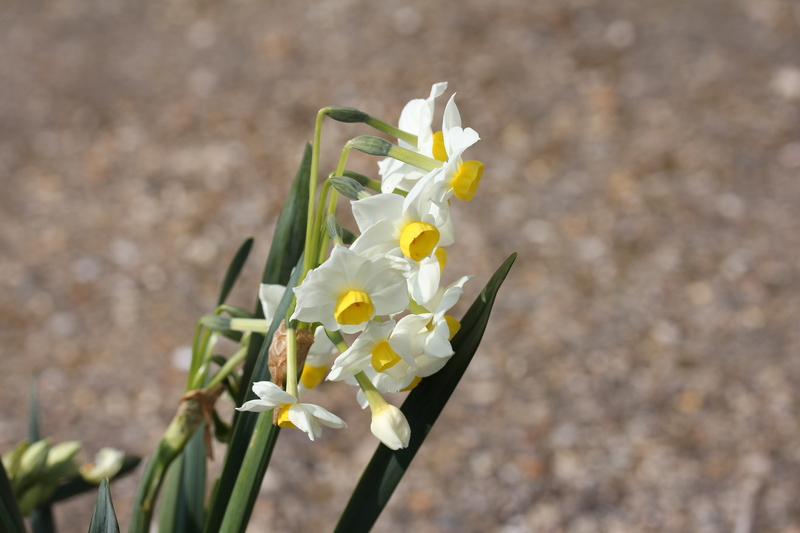 A few other bulbs blooming now – these Muscari, M. Latifolium are returning again from the wedding flowers. Last year they got rather eaten, so I’m delighted to see them back better than ever this year. And interestingly, for those who remember the saga of me trying to get these and the N. Elka flowering together on the day,the Elkas are currently nowhere to be seen! This last one is the Crocus chrysanthus Miss Vain. The majority are over now, but if you look closely you’ll see there are daffodils to follow, so hopefully the pot will shortly be rebooted! I found one of the first bees enjoying the Rosemary (R. prostratus). 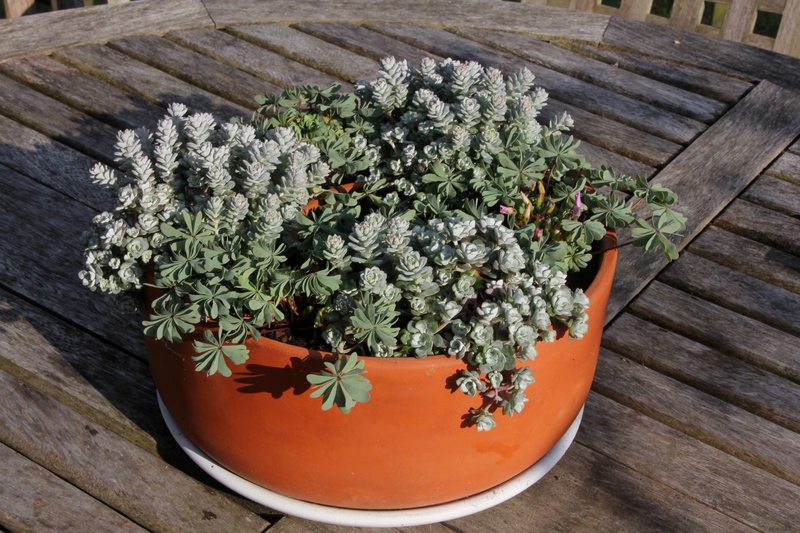 And I think I’ve mentioned that I’ve become a bit overrun with Euphorbia, but doesn’t that colour sing (zing?) in the sunshine? Talking of colour, I know it’s not a bloom, but I couldn’t resist including this Chard. Continuing on the pink theme, this Daphne x Pink Fragrance ‘Blapink’ is really pumping out the blooms – and scent – now. It’s in a pot and currently seems happy, but I do wonder if I should plant it out. 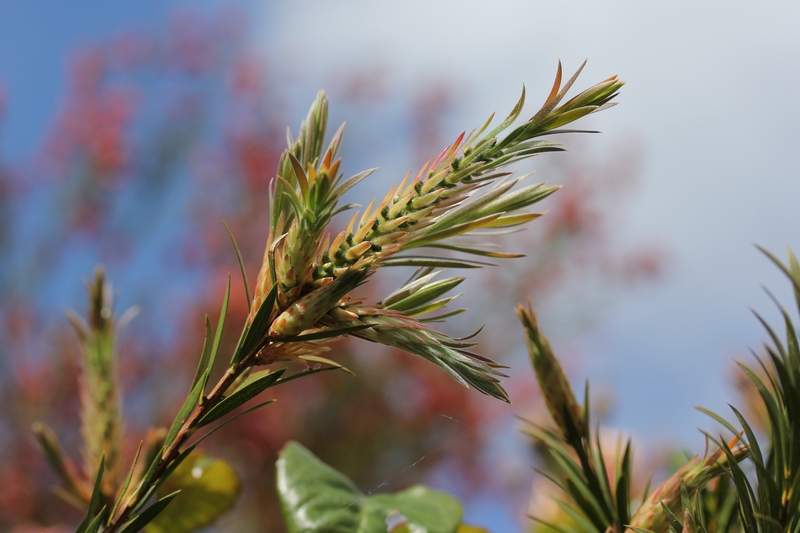 The tea tree plant, Leptospermum has just started blooming again after a little rest. Sadly it has got rather leggy now and I’m not convinced it would resprout from the bottom if I pruned it hard. Any clues? There are still plenty of Hellebores but I thought this one was very fine. Strangely I have no memory of seeing it before, but it seems rather too glamorous to be self seeded. but H. Aphrodite is still being rather shy. And to finish, because it was such a glorious day it almost felt like a quick dip might be fun, here’s the Diving Lady, with her pool. 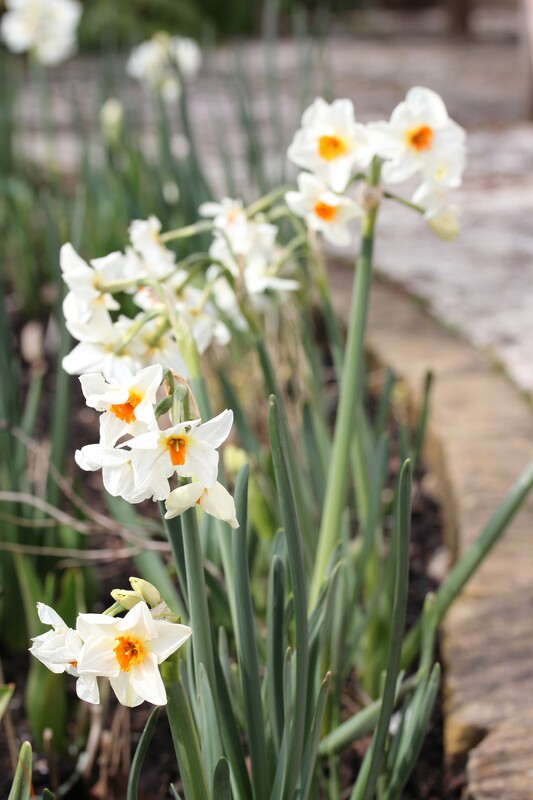 This entry was posted in Garden Bloggers' Bloom Day and tagged Crocus Chrysanthus Miss Vain, Daphne x Pink Fragrance 'Blapink', Hamamelis Arnold's Promise, hellebores, Leptospermum, Muscari Latifolium, Narcissus 'Cragford', Narcissus Jenny, Narcissus Minnow, Narcissus Peeping Jenny, Narcissus Tete a tete, Rosmarinus prostratus on March 15, 2017 by jenhumm116. 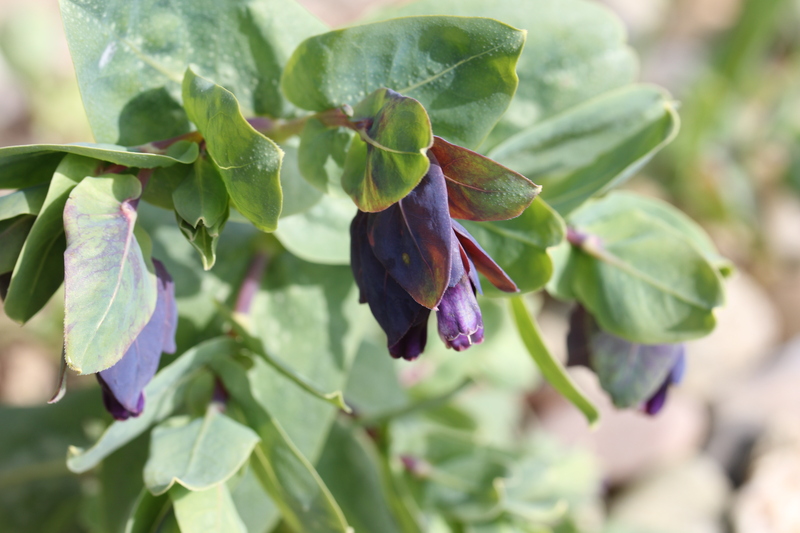 I’m starting with this lovely group of Fritellaria meleagris which I have to confess I bought in a pot from Waitrose. The ones I’d planted in the shady lawn a couple of year ago seem to have dwindled to nothing, and I was feeling their loss. I can’t quite decide whether I’ll plant these out after flowering or if it’s all rather a lost cause. I do so love them. and, oh look, my first N. Jenny! I went a bit mad with the Crocus ‘Cream Beauty’ this year after they were all eaten last year, and I’ve now got plenty in various pots, having kept them safe in the greenhouse during their infancy. 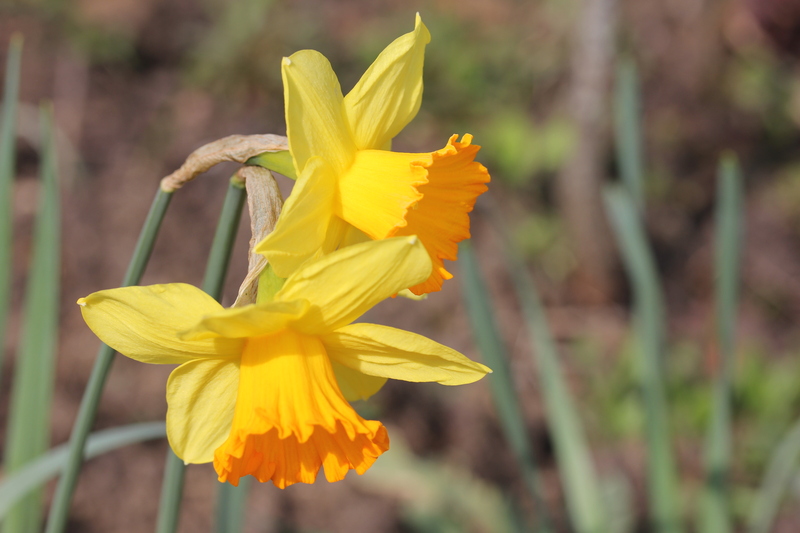 One advantage of a failing memory is that I can’t remember which Narcissus I planted to follow on – I could look it up, but think I’ll just wait and see! 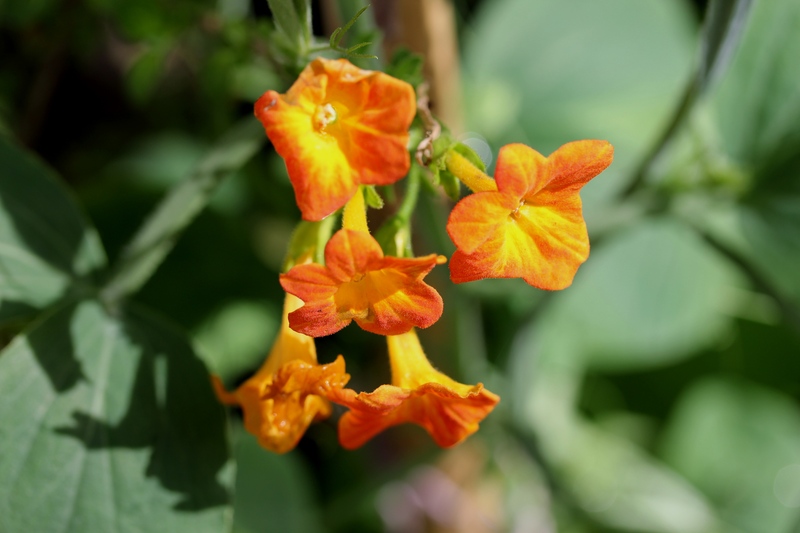 ‘Arnold’s Promise’ are still blooming with their beautiful orange and lemon zesty flowers. 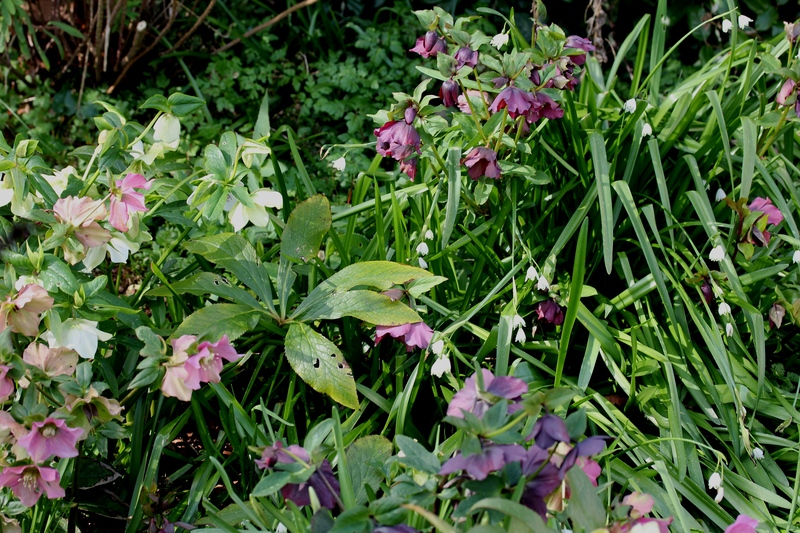 The Hellebores have gone from strength to strength with all the clumps significantly bigger than a year ago. 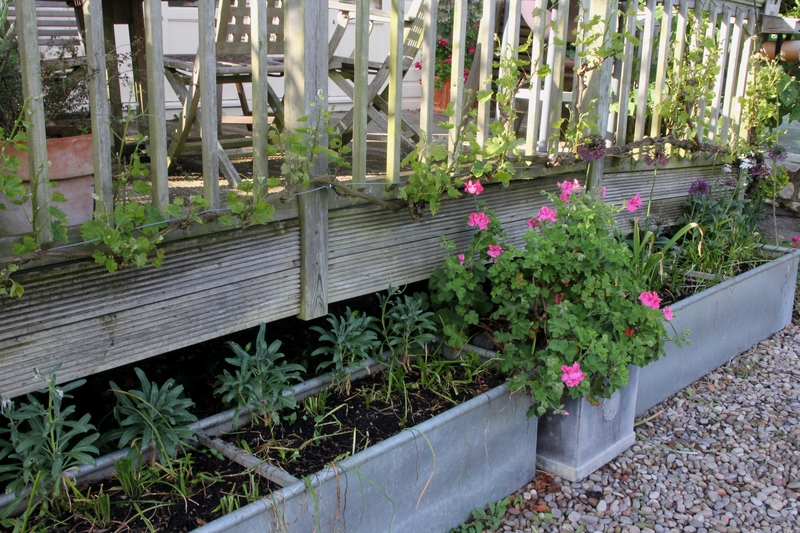 and a couple of Pelargoniums which somehow never got brought in over the winter. Luckily I seem to have got away with it! This is a plant I don’t think I’ve ever featured as I havent known it’s name. 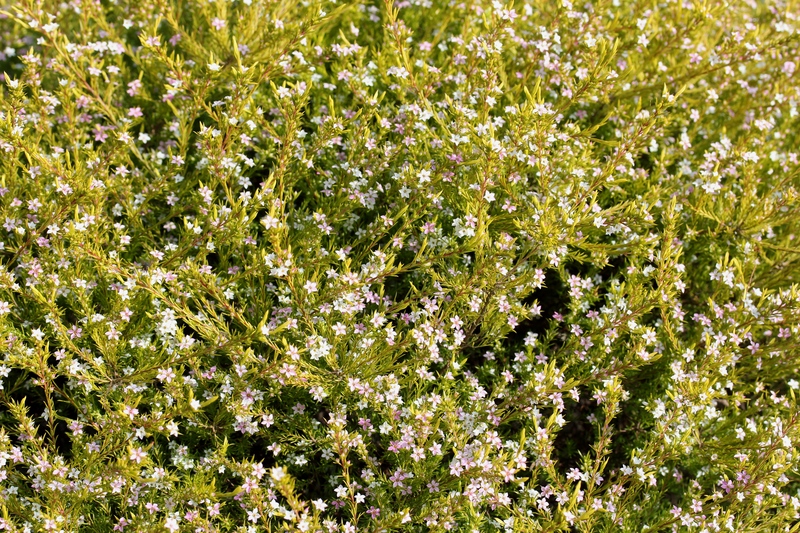 For the majority of the time it looks like a low growing conifer, but at this time of year it’s smothered in these tiny white/pink flowers and is absolutely stunning. I finally discovered its identity at the recent RHS show, it’s a Coleonema, I think Coleonema ‘Sunset Gold,’ and it’s an absolute belter. Another favourite, the Leptospermum (or tea tree plant) still covered in blooms. 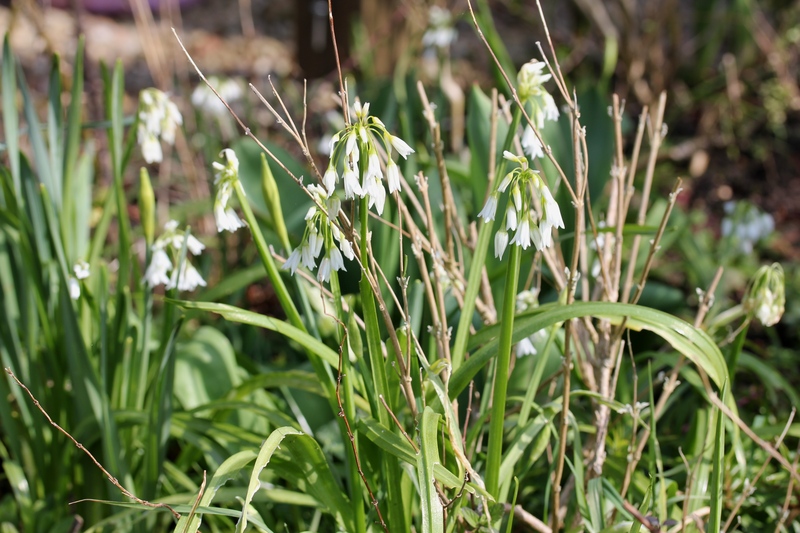 And to finish, something I really wish wasn’t here – one of a number of clumps of wild garlic, or ransoms, Allium ursinum. I’d better get weeding. 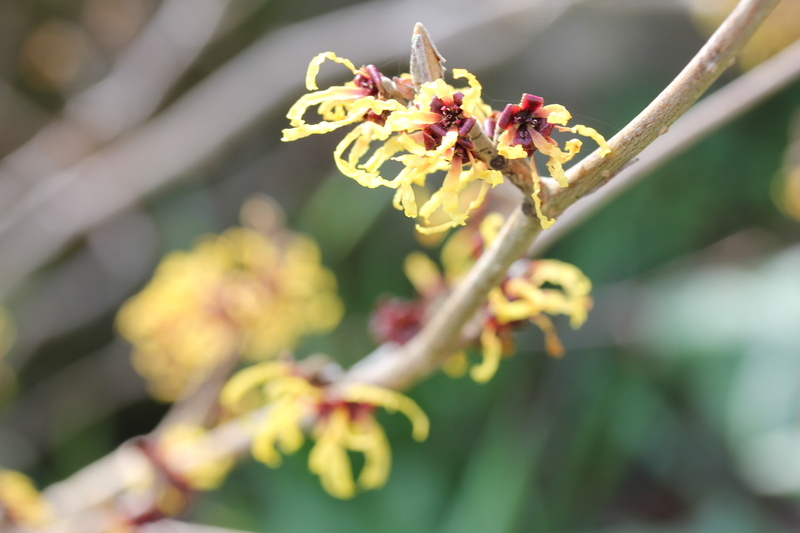 This entry was posted in Garden, Garden Bloggers' Bloom Day and tagged Cerinthe major purpurescens, Coleonema 'Sunset Gold', Dianthus, Fritillaria meleagris, grevillea, Hamamelis Aphrodite, Hamamelis Arnold's Promise, Leptospermum, Narcissus 'Cragford', Narcissus Jenny on March 15, 2016 by jenhumm116.